Here in the frozen North, we live in Maine’s historic Swedish Colony. The Scandinavian settlers who came here in the 1800s left an indelible mark on the land, the community, and the customs. Few still speak the old language, but everyone turns out to celebrate traditional Swedish holidays and festivals. Under the old Julian calendar, December 13th was Christmas Day, and also the longest night of the year. In the early hours of the day, before dawn, the eldest daughter in each family donned a long white gown and a crown of lingonberry leaves and seven lighted candles, then proceeded through the house, attended by the other children, bringing breakfast to her sleeping parents. Thus began the Christmas season. Legend has it that long ago a maiden dressed in white and illuminated only with candles brought food to starving villagers in this darkest time of the year, and thereby saved their lives. St. Lucia Day celebrates light in the darkness and kindness in difficult times. It seems particularly relevant now. And so, on Tuesday evening we found ourselves in the gymnasium of our little elementary school, preparing to take part in our first St. Lucia Celebration. 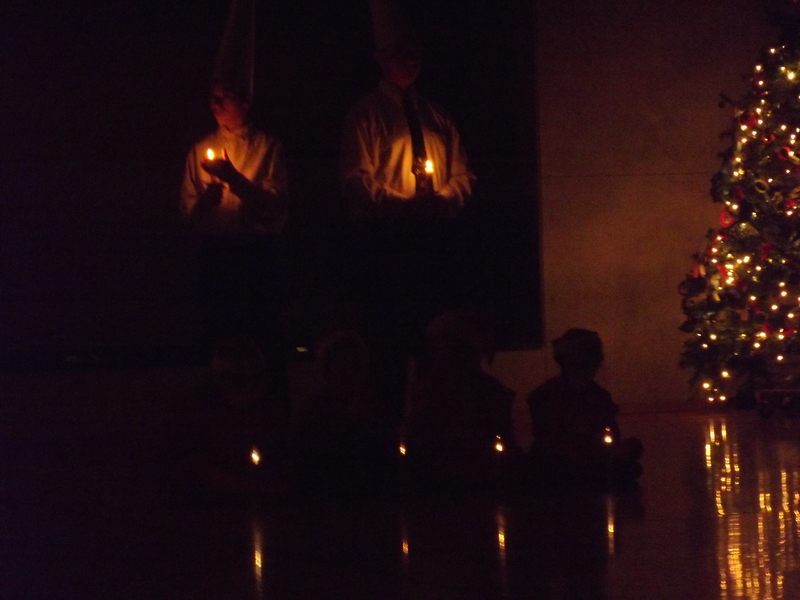 The eighth grade students played the parts of the Lucia Bride and her attendants, the Little Stars. 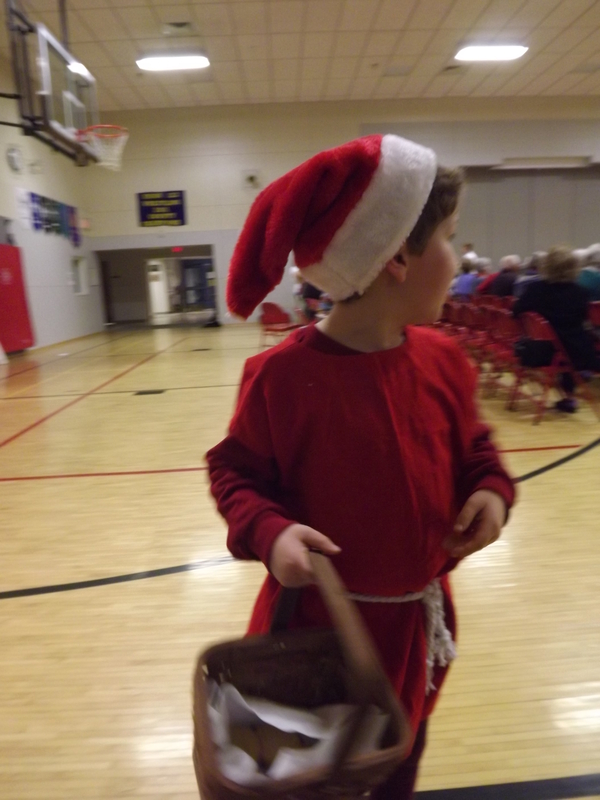 Our big boy and his eight first grade classmates were tomtegubbar and pepparkaksgubbar–Christmas elves and gingerbread men. 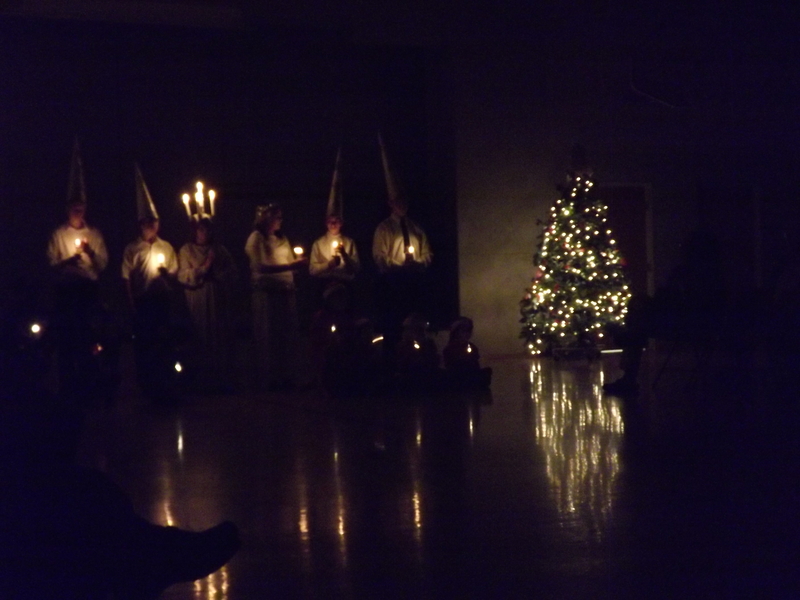 We sat on folding chairs and wooden bleachers, in the dark, and watched the candlelight procession. 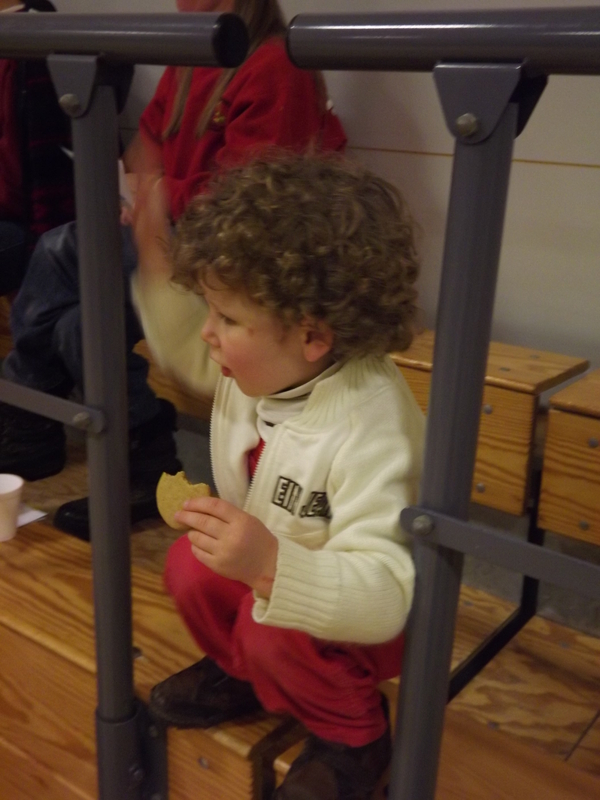 When the lights came up again, our little tomtegubbar and pepparkaksgubbar handed round pepparkakor, crisp ginger spice cookies. We held the cookies in the palms of our hands and rapped them with the first knuckle of the other hand, making a wish as the cookies broke. Those whose cookies split in three pieces are bound to have their wishes come true. Children danced round the Christmas tree, babies crawled on the floor, grandparents cracked cookies with practiced ease. And when we once again ventured out into the cold, we took a bit of light with us.